Every home it is made with a slight variation. 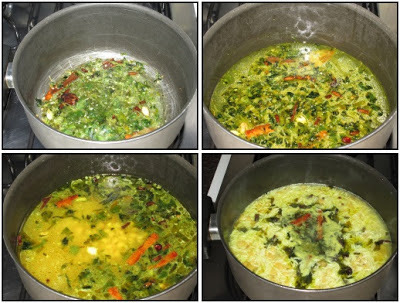 I have made it the way my grandma used to make it with chana dal. Some don't add chana dal, while some like to add tomato. 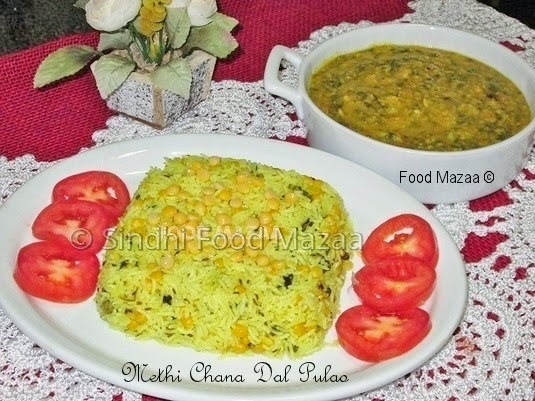 This is usually served with Sai Bhaji ( Sindhi Palak ). 2. Wash and soak the rice. 3. In a pan heat a little oil and add the cardamoms, clove, bay leaf and cinnamon. 4. When they give out an aroma, add the garlic, ginger, green chillies and saute. Tip in the methi leaves. 5. Add the rice and temper with salt, and coriander powder. 6. Add 2 cups of water and when it starts boiling add the half-boiled chana dal. 7. After it starts boiling reduce the flame and cook until done. 9. Stir it very carefully and place the pan on a hot griddle for dum. Tip: I use a chop stick to stir the rice carefully in order not to break the grains and avoid making it mushy. This looks really healthy and filling. 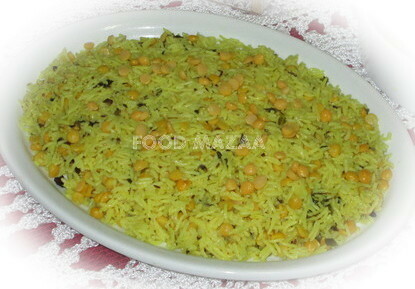 I make rice but toor dall but not chana dall. Another winner from your kitchem.